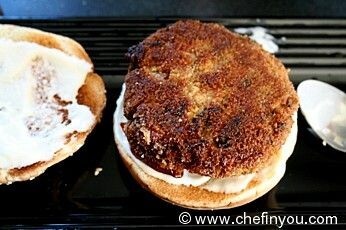 I have searched for umpteeth tofu burger recipes. Even tried a bunch of them to "Blech!" results! One thing that beats me is why in the name of "health" yucky recipes are created. Either you find sinfully rich recipes that you hate to indulge cos of the calories or you find "healthy" recipes that are so bland and sub standard that you don't want it. How about - something in between?! Sounds logical doesn't it? Well you would think so, wont you?. 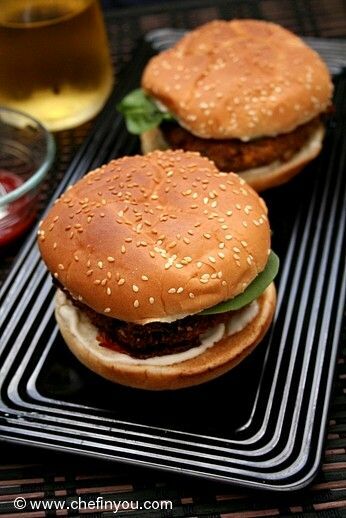 When I had all but given up my search for a good tofu burger , came this recipe from this cookbook called Vegetarian - tasty Recipes for Everyday that I happened to find in an acquaintance's house. I made a note of it and oh boy! 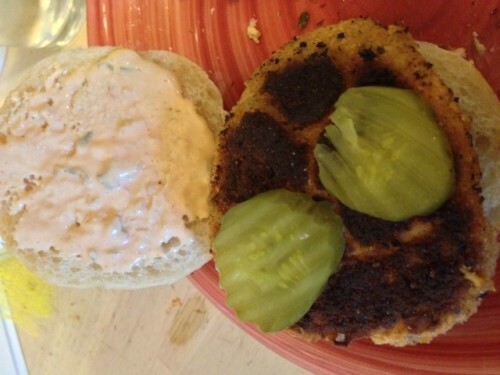 Am I glad that burger gods have finally blessed me with a 'never-to-part-with' recipe. We loved it immensely. The Changes I Made Since we all have our tastes, I made the following changes from the original recipes. It keeps in mind both our requirements and also the fact that I made use of what was available in my pantry. 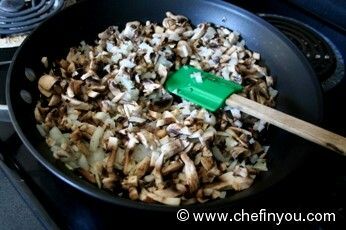 Instead of Swiss Brown mushrooms that the recipe called for, I used cremini mushrooms. The Basil got replaced with cilantro. 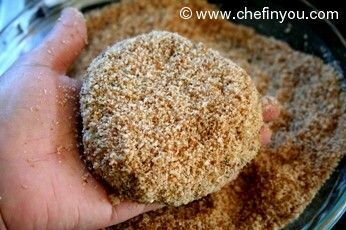 The regular wholemeal breadcrumbs was replaced with wholegrain flax seeds bread crumbs that I had in hand and which I freshly ground to make the crumbs. The 1 egg used in the original recipe got replaced with 1 heaped spoon of tomato paste. Also I did not have either the sweet chilli sauce/ arugula or semi dried tomatoes. So I used chilli garlic sauce to our taste, spinach leaves and sun dried tomatoes in oil respectively. 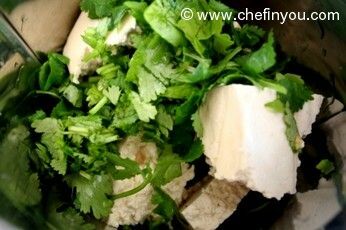 I am guessing you can use Extra firm Tofu, pressed well with paper towel to drain the water , for this recipe. But I use the one which does not come with water. This is a super firm variety and it holds up very well when it comes to grilling, frying, stir fries, burgers etc and I use it regularly. I get it from Whole Foods. Please note that I am not paid by the company to talk about them. I mention it cos I use it regularly and it works well for my needs. 1. In a pan, heat about a tsp of olive oil and sauce the onions until soft. Add the mushrooms and cook for another 3-4 minutes and cool slightly. 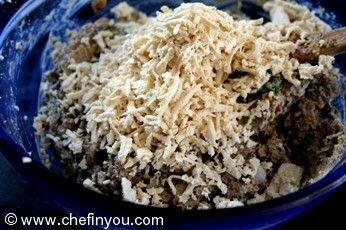 4. transfer this to a bowl and stir in the onion- mushroom mixture, breadcrumbs, tomato paste, vinegar and hot sauce (or sweet chilli sauce). 5. 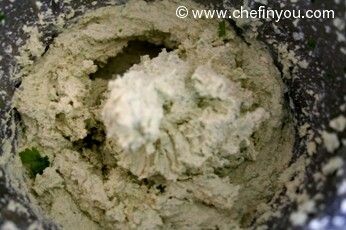 Grate the remaining tofu and add it to this mixture. 6. 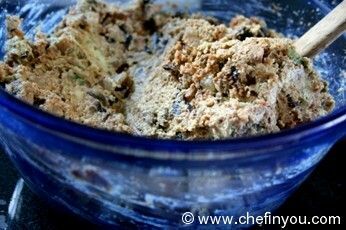 Stir until well mixed and then refrigerate for about 30 minutes. 7. Divide this mixture into 6 patties, pressing together well. 9. 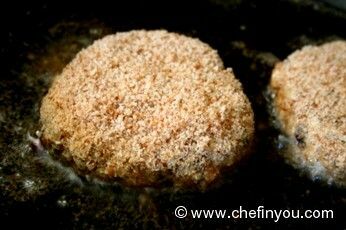 In a pan ( i used the same where I sauted the onion and mushroom mixture), add some olive oil to coat the pan and shallow fry or pan fry the patties. Preferably you would want 1 cm (1/2 inch) oil in a deep frying pan. 11. Now starts the assembly. I know you dont need pictures for this - but in the spirit of this website I thought I will humor myself and you :) Toast the bread. Spread some mayo on one side of each roll. 15. Press it down with another roll with the spread facing below. I loved the flavors even without any mushrooms on hand. I did however have to add an egg (I'm not vegan anyway) to get it to bond together better for the second batch after the first crumbled to pieces when trying to flip it. I likely didn't have the correct tofu as you stated in the recipe and should have let more water seep out before making them but I was pressed for time. I finished it off with some dill pickles and homemade "secret sauce". Nice work, I'll be making them again! Made this recipe twice, improvised alot both times with comparable ingredients in recipe. Both times it tasted different, but both times it was really good. Where is the recipe???? I made these before, came back to make them again and I can see the steps but there's no outline of ingredients. How much of each ingredient is used?? Awesome! Can't wait to try this. 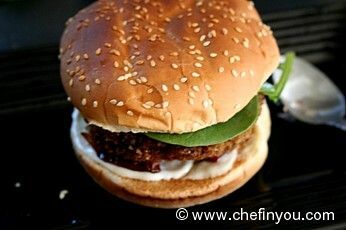 I've been trying to find the best recipe for a good veg burg and it's mostly been a bust. I mean they tasted good but were too mushy. So basically delicious mush. How's the consistency in these? I know an awesome egg replacement too! Tbs ground flaxseed or powder, in 3tbs water. Mix it up. Let sit for 10 mins or more. And BAM...the exact same consistency as egg. Just as sticky too! I was sent a link to this post and laughed so hard at your description of the nasty recipes people have the gall to post online. Been there. Can't tell you how many hundreds of dollars I've wasted on food creating those disgusting concoctions. 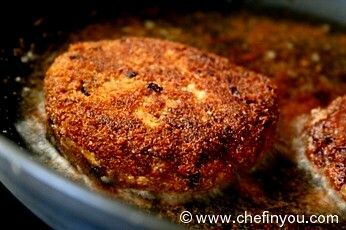 Since you think like I do, I am gonna put some faith in you and try this recipe tomorrow. Thanks for sharing. :-P Sounds delicious! 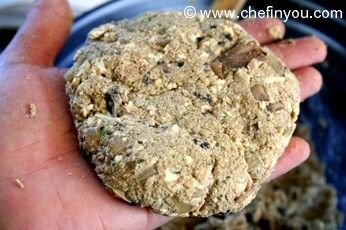 I'm making these for dinner tonight; one question- I have Cold Milled Golden Flax Seed, can I use this in place of the bread crumbs and if so, do I need to add anything else to the flaxseed? Hello I need to try these burgers.they look yummy. Thanks for the recipe. Hi they look so good never made them yet . But would like to know if I made enough of them can I freez them ? I am about to make this recipe now..I am leaving out the mushrooms...I have tomato paste..but I see some are posting about using eggs and I don't hve any...do u think I should get one to make sure they do not fall apart...this looks delicious and I want my kids to enjoy it! 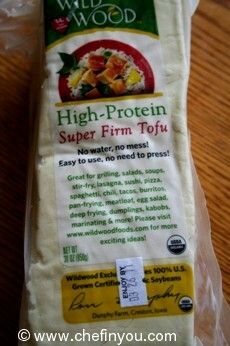 Funny I did not know they had super firm tofu I haven't been to the health food markets in a while..kinda expensive...I am trying to see if making my own burgers will definitely save me money from buying those expensive processed ones. I hope this works out for us! Any suggestions, tips, or recipes on saving money througout the month? Thanks! 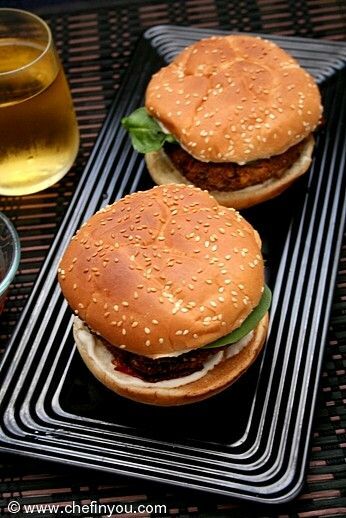 8) greetings,have the tofuburger been tried on a grille? Made these today! I left out the mushroom and added chopped spinach instead. 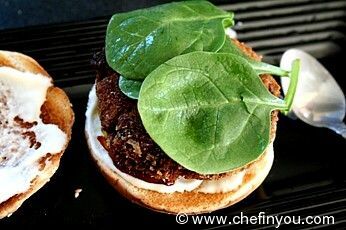 I also used basil and 1 egg white as per the original recipe.And I broiled them instead of frying. They came out REALLY well! Will definitely use this recipe again! Thanks so much! :mrgreen: This was so good! I left out the mushrooms(i hate mushrooms) and used the cilantro, sweet chili sauce, and an egg instead of the tomato paste I also did not have the balsamic vinegar so I just left it out. It was so good! I've made it a couple times since and am making it again this week. I topped it with sweet chili sauce, goat cheese and bread & butter chip pickles...absolutely DELISH! This sounds so delicious !!! I will try it out soon and give you my feedback. My only doubt was..how can I prepare the patty from the ground mixture without it being "sticky"? It looks sticky in the pictures..Any tips for this? Do these freeze well? I would love to make ahead and have in the freezer whenever I need a protein fix. i tried this and it did not come out, i guess i didn't drain the water that well, and since i couldn't find any that was dry i bought this one, and i opted out of the bread crums too, i just ended up cooking the whole thing and using it as a spread for the burger instead of a patty. NO OIL!!! 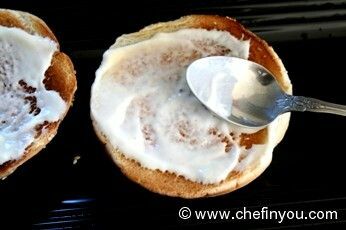 When I made these I used my stove top grill and a little bit of Pam for nonstickiness and that worked well! :) I've got kids (7, 5, and 3) and I usually have to double the recipe for the four of us because they are that good!! Also, I skip out on the spinach and sun dried tomatoes (although very good) and go Old School with normal tomatoes, onions, pickles, veganaise, and ketchup; perfect! Another tips is J&D Bacon Salt is a good seasoner. Why did I add that comment? Well J&D is vegetarian and very low in sodium!!!! Yes, Bacon Salt. Vegetarian and very low sodium! yummy grabeh sarap :! : 8) it's so cool astigggggg!!!!!!! :lol: yummy :) i luv it.. I havent personally tried either of them but they do hold pretty well. So I personally dont think you will need all that oil. :-P I made these today and they're pretty good. I don't care for cilantro so I used basil as per the original. I love the addition of the balsamic vinegar. It gives it such a tangy bite. 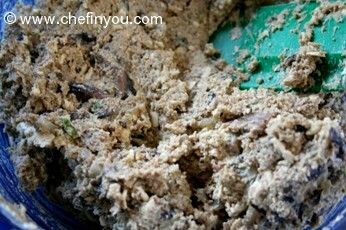 I chopped the mushroom and onion in my food processor to fine pieces. I also added salt, garlic and pepper. These held their shape surprisingly well. They didn't fall apart at all. Definitely a keeper recipe. Thanks for sharing. AND YOU GUYS SHOULD TRY IT! 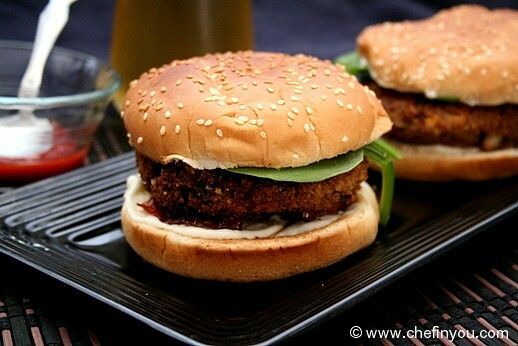 HI Dk, Want to try these burgers but my husband does not like mushrooms so can u please suggest me the substitue for mushrooms. Thanks. okay it looks delicious, but not very easy is it? 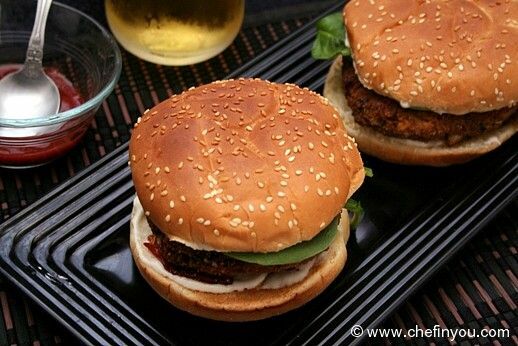 Very inviting and filling burger,simply irresistible..
Yummy burger... Superb combination of flavours:)I am sure it must have tasted heavenly .... looks delicious and wholesome... 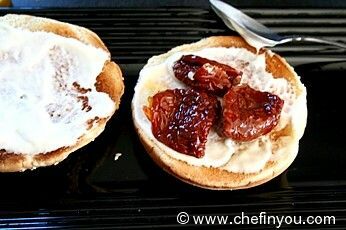 This is a must try recipe..
Love the sound of this, especially the addition of sun-dried tomatoes on the buns!